The Dugong (officially: Dugong, dugong) is a marine animal that lives in warm coastal waters of Red Sea, East Africa, Australia, Japan and Philippines. Its name is derived from the Malay duyung, meaning "lady of the sea" or ‘mermaid’. It is the only living representative of the once-diverse family Dugongidae; its closest modern relative, Steller's sea cow (Hydrodamalis gigas), was hunted to extinction in the 18th century. The dugong is also the only marine strictly vegetarian mammal. -Manatees have a large, horizontal, paddle-shaped tail with only one lobe, which moves up and down when the animal swims. Dugongs have tail flukes with pointed projections, like a whale with a slightly concave trailing edge. -The dugong lacks nails on its flippers, which are relatively short. -Manatees are generally larger than dugongs and can weight between 400 and 500 kg and grow to a length of 3.6 metres. Dugongs rarely grow larger than 3 metres and weight is, on average 420 kg. Behavior and habitat Dugongs are long lived and have few natural predators, although animals such as crocodiles, killer whales, and sharks pose a threat to the young. Like manatees they often suffer from injuries caused by boat strike impact or by propellers of motor boats cruising in their territories. Fast boats travelling in shallow water over sea grass beds pose the greatest threat. Gatherings of hundreds of dugongs sometimes happen, but they last only for a short time. 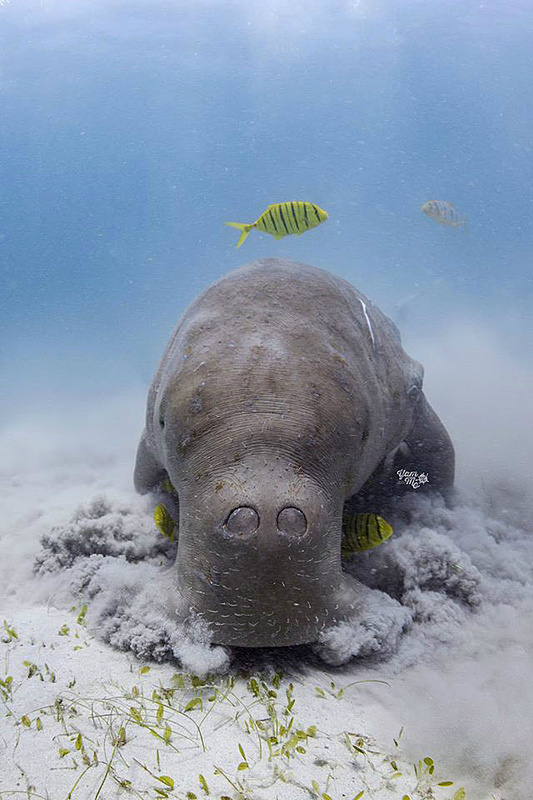 The exceptional large populations of Shark Bay and Moreton Bay along the Queensland coast of Western Australia are thought to be stable with over 10,000 dugongs Large populations are also found in Torres Strait south of New Guinea and in the Persian Gulf. But in other areas their numbers are reported to decrease steadily due to human interventions. The main causes of population decline include fishing-related fatalities, collision with motor vessels, habitat degradation and hunting. With its long lifespan of 70 years or more, and slow rate of reproduction, the dugong is especially vulnerable to extinction. Dugons have poor eye-sight and depend on the bristles on their upper lip for orientation. Cows and their calves communicate by exchanging high pitched 'chirps'. Dugongs are often escorted by 'pilot fish': actually these are juvenile Golden trevallys (Gnathanodon speciosus), attracted by the sediments stirred up by the dugong. For UW photographers with fish-eye lenses these bright yellow fishes create a nice photogenic contrast with the greyish bulky body of their host. Similar to the black and white pilot fish (Naucrates ductor) escorting Oceanic sharks. Although dugongs are social animals, they are usually solitary or found in pairs. This might be due to the fact that seagrass beds do not support large populations and dugongs spread out to gather sufficient portions. The dugong is largely dependent on seagrass for its existence, and is thus restricted to shallow sandy coastal habitats which support seagrass meadows. Preferred species are the fast growing Halophila and Halodule. But sometimes they venture further away from the shoreline where they dive to 30-40 meters in search of the seagrasses Halophila spinulosa. Just like cows in the meadows, their grazing stimulates the growth of new grass and may contribute to abundance of seagrass species that are preferred by dugongs, at the expense of less preferred species. They will dig up an entire plant and then shake it to remove the sand before eating it, using their flexible and muscular upper lip to dig out the plants. They may even collect a pile of plants in one area before eating them. Furrows in the sand often mark the path they have followed. Conservation of the seagrass fields remains an important condition for their survival, especially in coastal areas where their growth is under pressure by human activities. Winger, Jennifer (2000). "What's in a Name: Manatees and Dugongs". National Zoological Park. Archived from the original on 2007-10-13. Retrieved 22 July 2007.